System-on-chip is an important part of consumer electronics industry. It serves a dynamic range of applications in multiple end-use industries around the globe. The system-on-chip market is witnessing significant technological advancements across the industry and has witnessed significant growth during the last two decades due to the growing consumer electronics industry. The system-on-chip market is expected to grow significantly with focus on augmenting the rapidly growing applications ranging from smartphones to networking devices. The market for system-on-chip is forecast to quickly grow to US$ 206.79 Bn by 2026 at a CAGR of 11.0% during the forecast period. The system-on-chip market has seen significant growth due to rising applications across end-use industries, with smartphones application holding the largest market share. Industries such as consumer electronics, telecommunication, and healthcare have been leading verticals in adopting system-on-chip technology so as to enhance the performance of smart devices, networking devices, and biomedical devices. Within application devices, smartphones and PC/laptops have been in the forefront, with networking devices and gaming consoles gaining momentum of late. A close study of recent product launches and developments of key industry participants active in the system-on-chip market reveals that industries such as consumer electronics, telecommunication, and healthcare would continue to dominate the market throughout the forecast period. Applications such as gaming consoles and digital cameras are expected to witness demand for the adoption of system-on-chip during the coming years, helping the system-on-chip market to take significant strides toward growth in the second half of the forecast period. Factors such as rise in demand from smart devices, lowered cost per function of ICs, and the increasing demand for multicore technologies is seen as crucial aspects influencing the market growth trends. The system-on-chip market however faces challenges such as overlapping functionalities and the technological advancement in the form of new embedded software that has negatively affected further large scale proliferation of technology. The existing technology integration and overlapping functionality challenges give way to possible opportunities, such as improvement in the cycle time of the overall system and the 3D integration of system-on-chip. Any further development and exploration of the system-on-chip structure is expected to open new sets of unexplored opportunities, thereby supporting the growth of the system-on-chip market during the forecast period. Attracted by this fast expanding market and underlying latent demand, many players are driven to invest in the market for system-on-chip products and services. These factors have led companies to strengthen their foothold in the system-on-chip market. For instance, in September 2017, Apple Inc. deigned a new system-on-chip for the latest iPhone 8 named as A11 Bionic. A11 Bionic is a powerful and smart chip designed for a smartphone. A11 has a hexa core CPU that uses heterogeneous multiprocessing. New entrants may find it challenging to establish themselves in the market without a unique value proposition due to competition from established players such as Samsung Electronics Co. Ltd., Intel Corporation, Toshiba Corporation, Taiwan Semiconductor Manufacturing Co. Ltd. and others, which already have strong network and technology expertise in the market. Some of the prominent players identified in the system-on-chip market and profiled in the study include - Apple Inc., Broadcom Limited, Infineon Technologies, Intel Corporation, Qualcomm Inc., Samsung Electronics Co. Ltd., STMicroelectronics N.V., Taiwan Semiconductor Manufacturing Co. Ltd., Toshiba Corporation, MediaTek Inc., Maxim Integrated Products, Inc., Microchip Technology Inc., Texas Instruments, and ON Semiconductor. This comprehensive report by Transparency Market Research analyzes and forecasts the system-on-chip market at the global and regional level. The report provides an analysis over the period 2016–2026, wherein 2018 to 2026 is the forecast period and the base year is 2017. An in-depth and unbiased market assessment has been made to offer readers in-depth and accurate analysis. The report emphasizes on all the major trends and services playing a key role in the system- on-chip market growth during 2018 - 2026. It also focuses on restraining factors, market drivers, and opportunities of the system-on-chip market during the said period. 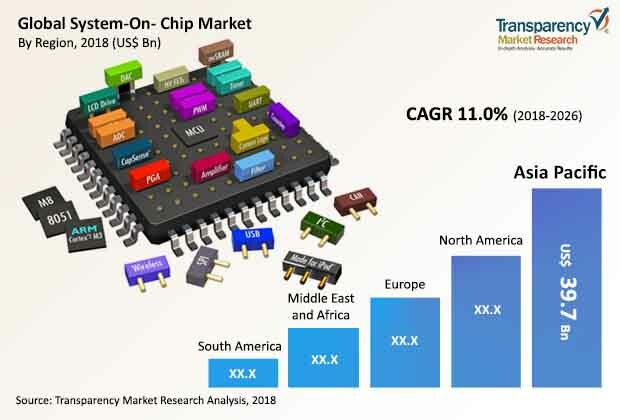 The study provides a complete perspective about the system-on-chip market’s growth throughout the research study in terms of value (in US$ Bn) across various geographies, including Asia Pacific, South America, North America, Middle East & Africa (MEA), and Europe. The report includes a detailed value chain analysis, which focuses on a comprehensive view of the global system-on-chip market. Porter’s Five Forces analysis is also provided to understand the competitive scenario in the global system-on-chip market. The study incorporates system-on-chip market attractiveness analysis, wherein the segments for type, application, and significant end-use industries are benchmarked based on their market size, growth rate, and attractiveness in terms of opportunity. In order to give a complete analysis of the overall competitive scenario in the system-on-chip market, every geographic region mentioned in the report is provided with attractiveness analysis. A market overview chapter in the report explains the market trends and dynamics, which include the market restraining factors, drivers, and opportunities for the current and future system-on-chip market. A global market outlook analysis has also been provided in the report. Additionally, the report also provides analysis of different business strategies being adopted by market leaders of system-on-chip. Market introduction chapter assists in gaining an idea of different trends and services related to system-on-chip along with their types, applications, and end use industry. The report highlights the competitive scenario within the system-on-chip market, thus ranking all the major players according to key recent developments and their geographic presence. The insights for the system-on-chip market are the result of our extensive primary interviews, secondary research, and in-house expert panel reviews. These market estimates have been analyzed by considering the impact of different economic, political, social, legal, and technological factors. In terms of country, the North America market is bifurcated into the U.S. Canada, and Rest of North America. Furthermore, the Europe market is analyzed across Germany, U.K., France, and Rest of Europe. The APAC system-on-chip market is segmented as China, Japan, India, South Korea, and Rest of Asia Pacific. Middle East & Africa region covers the G.C.C. countries, South Africa, and Rest of Middle East & Africa. Similarly, the South America region includes Brazil and Rest of South America. This report provides all the strategic information required to understand the system-on-chip market along with its type, applications, and end-users. The report also provides insights related to type, applications, and different end-use industries according to the various geographical regions mentioned above. Primary research involves telephonic interviews, e-mail interactions, and face-to-face interviews for detailed and unbiased reviews on the system-on-chip market, across geographies. Primary interviews are usually conducted on an ongoing basis with industry experts and participants in order to get latest market insights and validate the existing data and analysis. Primary interviews offer new and fresh information on important factors such as market trends, market size, competitive landscape, growth trends, etc. These factors help to validate and strengthen secondary research findings. Moreover, the data collected and analyzed from secondary and primary research is again discussed and examined by our expert panel. The research study includes profiles of leading companies operating in the global system-on-chip market. Market players have been profiled in terms of attributes such as company overview, financial overview, business strategies, and recent developments. Parameters such as system- on-chip investment & spending and developments by major players of the market are tracked. Some of the key players in the system-on-chip market are Apple Inc., Broadcom Limited, Infineon Technologies, Intel Corporation, Qualcomm Inc., Samsung Electronics Co. Ltd., STMicroelectronics N.V., Taiwan Semiconductor Manufacturing Co. Ltd., Toshiba Corporation, MediaTek Inc., Maxim Integrated Products, Inc., Microchip Technology Inc., Texas Instruments, and ON Semiconductor.